Early Digger records of Blue Mount show the first birth recorded in 1857 was that of James Embrey born to Jacob and Susan Embrey. A lot of early birth records showed Blue Mount just as Blue or Blue Mt, Blue Mtn or Blue Mts. There were 804 records of birth, death and marriages in variations of the spelling of Blue Mount between 1857 and 1888 and 134 births for Blue Mount in that time, with 21 deaths recorded. Occupations of the men who signed the petition were farmer, carpenter, miner, cooper, butcher, labourer, teacher, blacksmith, and storekeeper. On researching back through the author’s copies of The Blackwood Historical Society’s magazine, ‘The Blackwood Recorder’ of which the author was the Editor she found in Vol 8 – No. 2 October 1982 the article she wrote on the Society’s trip to the Blue Mount Cemetery on August 29th 1982. Names on Headstones in the Blue Mount Cemetery. 1982. Bowes – Timothy(uncle) died 27 Sept,1952. Fletcher – Charles died 8 Oct, 1891. 63 yrs. 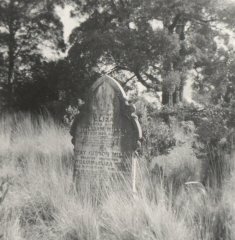 Fletcher – Ellen died 22 Feb 1929. 84 yrs. 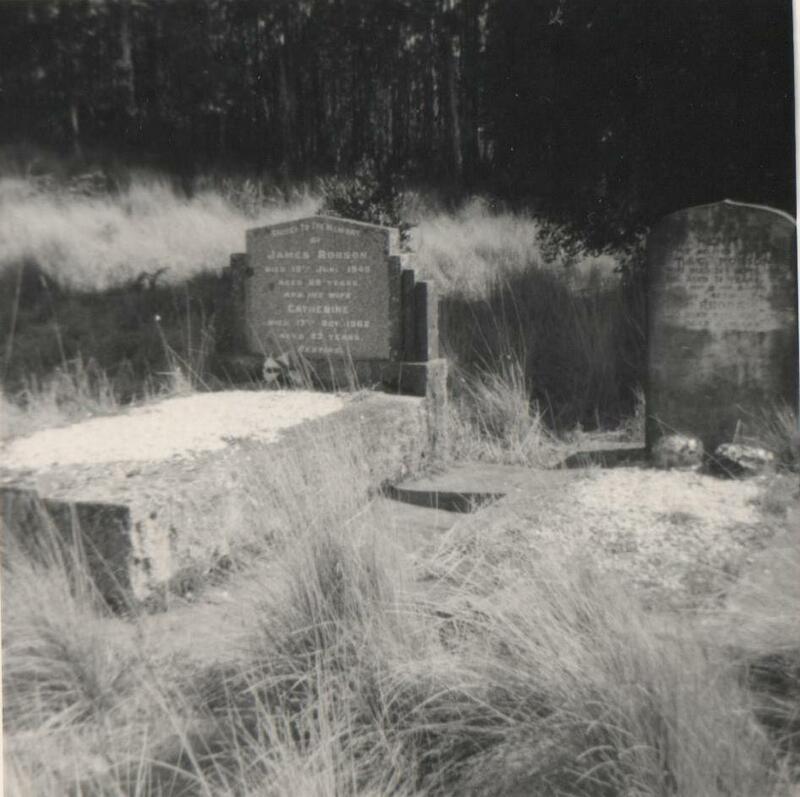 Fletcher ­- Esther M. died 9 Feb 1969. 83 yrs. 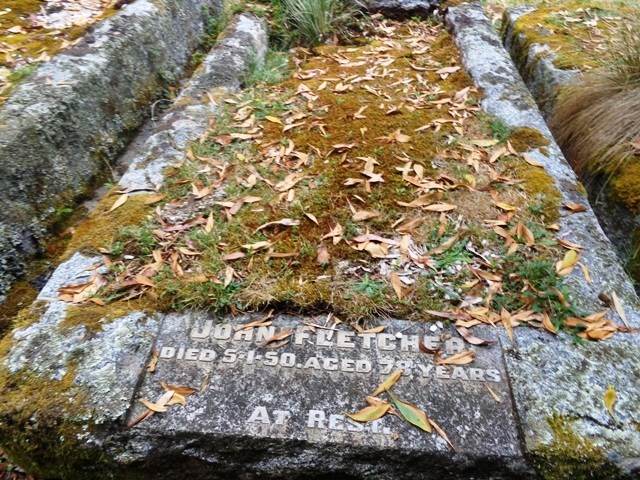 Fletcher – John died 5 Jan 1950. 78 yrs. Fletcher – Margaret died 16 June 1962. 85 yrs. Fletcher – Maria died 11 July 1961. 86 yrs. Higgins – Jane died 29 March 1938. 74 yrs. Higgins – Thomas died 18 July 1942. 83 yrs. 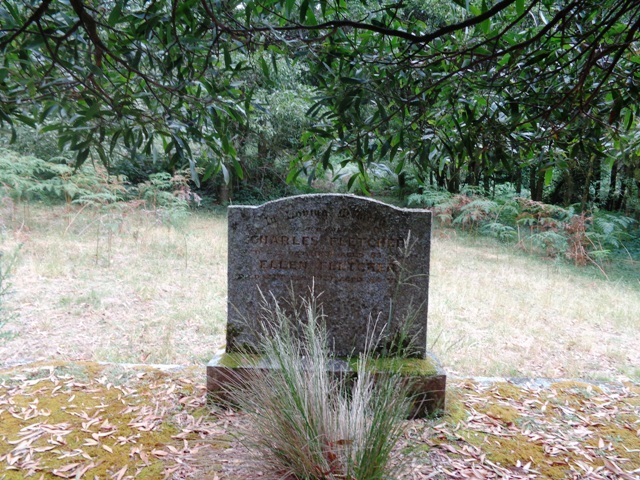 Miller – Eliza died 1 Feb 1890. 69 yrs. Miller – May Gibson died 19 Nov 1880. 10 yrs. Robson – Catherine died 17 Oct 1962. 83 yrs. 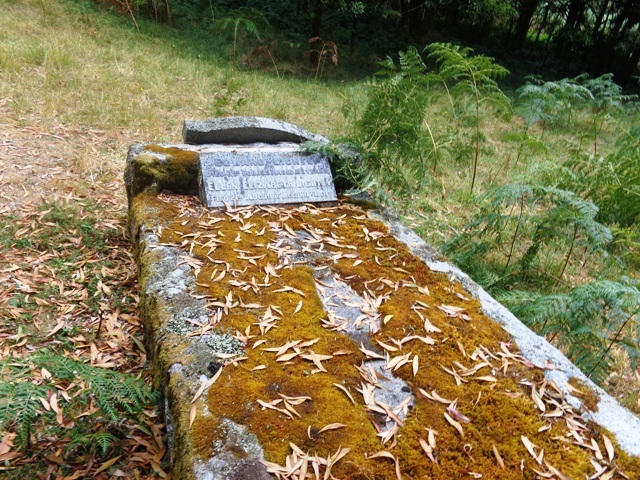 Robson – Henry died 4 Sept 1880. age 18 yrs. left – James Robson, Engine Driver, Trewhella foundry, died on the job 1940. 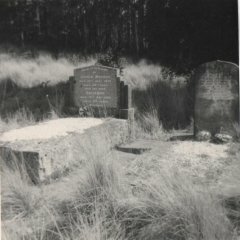 Courtesy Margot Hitchcock 1976.
above right – Grave of William (died 1905) and Eliza Miller (died 1890) and May Gibson Miller (died 1880, age 10 years). Courtesy Margot Hitchcock 1976. 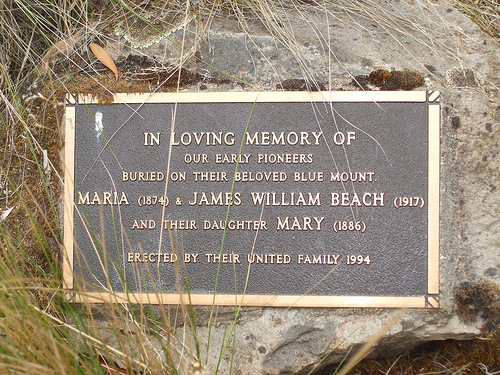 Monument erected in the Blue Mount cemetery in 1994 to the Beach family courtesy WindscreenCam from Internet. Photos Courtesy Margot Hitchcock Jan 2016. 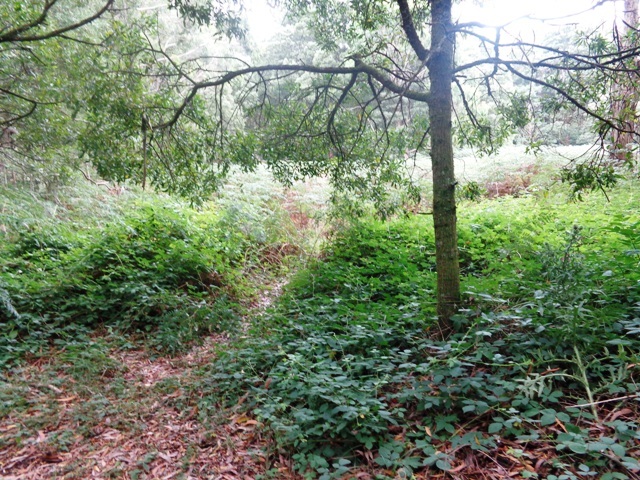 What the Blue Mount looks like now – very overgrown in parts. Jan. 2016. 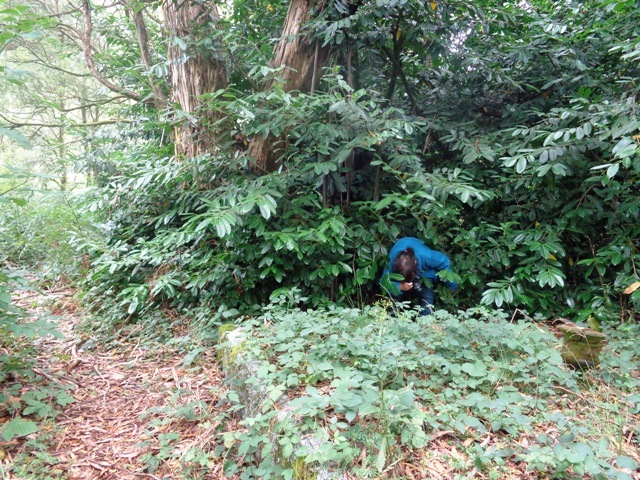 Maxine photographing name on tombstone under Laurel tree. 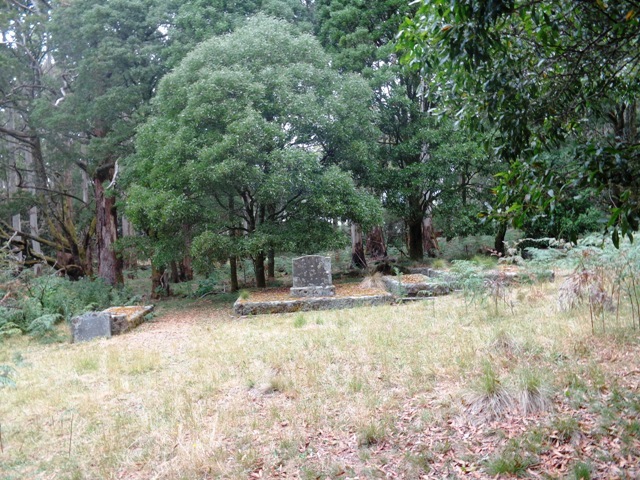 Graves in area not so overgrown at Blue Mount cemetery. Jan 2016. Grave of Charles Fletcher Blue Mount cemetery. Jan 2016. Grave of John Fletcher Blue Mount cemetery. Jan 2016. 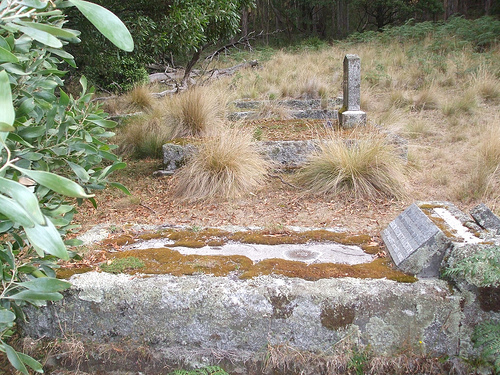 Grave of Edward and Ellen Lightley Blue Mount cemetery. Jan 2016. 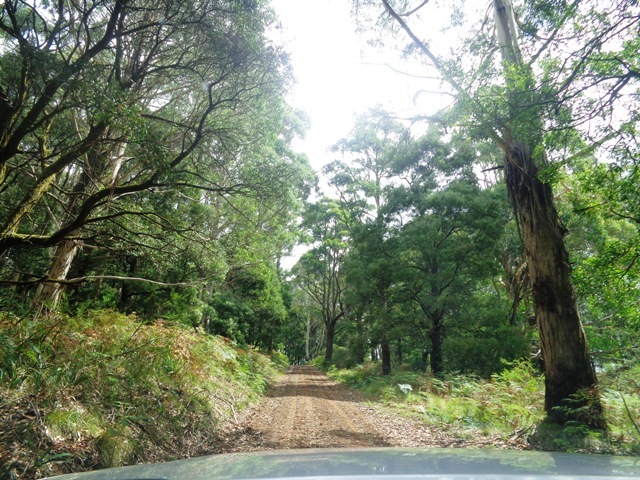 Four Wheel drive track up to Blue Mount cemetery. 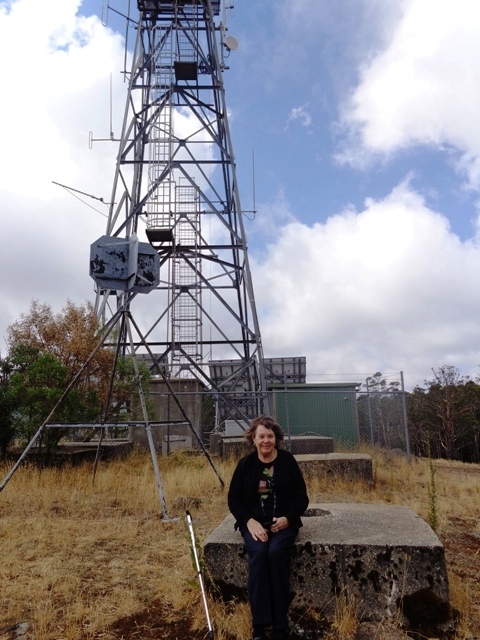 Blue Mount tower on top of hill with Margot Hitchcock. Jan. 2016.